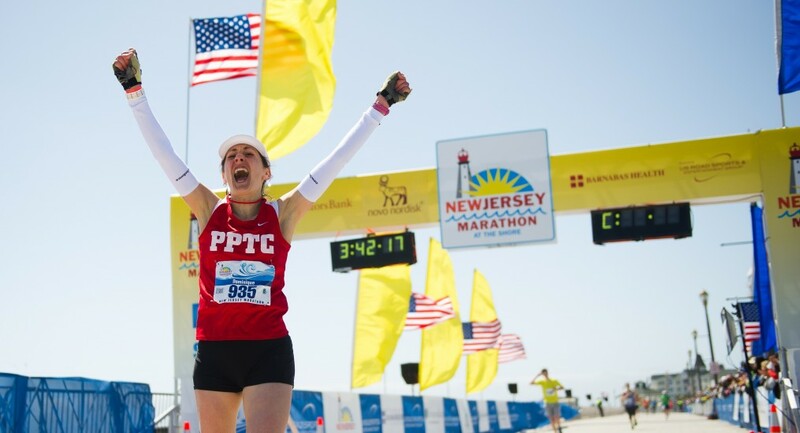 Thank you for registering for the 19th Annual Novo Nordisk New Jersey Marathon & Half Marathon weekend, which includes the 2015 RRCA New Jersey State Championship race in the marathon distance. In an effort to help make your participation more enjoyable throughout the entire race weekend, this is the ninth in a series of weekly messages containing important information. Copies of these messages will also be available on our Website and on our Blog. Links to them will be posted on both Facebook and Twitter. Race Day Security Information for: Athletes, Spectators, Sponsors, Press, Volunteers & Race Staff should be reviewed prior to Race Day. Parking for the ShapingNJ 5K and Barnabas Health Family Festival and Kids Races: Lots will be available in Pier Village for $5, as well as on street parking around the area. The Start/Finish Location: The 5K, Kids’ Races, Kid’s 1.2 Mile Marathon, Kids Move The New Jersey Marathon Run and Family Festival will all be held at the Oceanfront Promenade in Long Branch: between the Ocean Place Resort and Rooney’s Restaurant. Additional information is available on our website. Getting to the Start: There are no anticipated road closures on April 25. Good access should exist from the west via Rt. 36, from the north via Rt. 36 and from the south via Ocean Ave. / Blvd., and all local roads. Security Restrictions: Report any suspicious behavior and unattended bags to Race Staff/Police. Getting to the Expo: The address is 175 Oceanport Ave., Oceanport, NJ 07757. Rt. 36 west from GSP Exit 105 and Rt. 18 Exit 13B provide the main access to Oceanport Ave. Many other route options are available using local roads. Expo Parking: All Expo parking will be inside the Grandstand Area of the park, off Oceanport Ave. VIP Parking: via the first right onto Park Rd. from the traffic circle followed by a quick right into the lot. All other parking: part way around the traffic circle to the left. All Expo parking is free. Race Packet Pick-up: Be sure to bring your bib # with you to the Expo to speed up the process. Look it up beforehand using the link on our website. Terminals will also be available at the Expo for anyone who doesn’t know their bib number. The Kids’ 1.2 Mile Run is the only event which requires a paid registration (either on-line or on-site on Saturday the 25th). Over 2500 Elementary School Children from Long Branch, Oceanport, Monmouth Beach and Perth Amboy have begun a multi-week program to accumulate either 12 or 25 equivalent miles of movement (depending on their age) before Saturday, April 25th. The children who have successfully met that goal will be invited to move (run, walk, etc.) the last 1.1 or 1.2 miles with us in order to complete the half or full marathon distance, during the Kids’ 1.2 Mile Run. This program is enabled by the enthusiastic support of: the School Districts, Novo Nordisk (sponsoring the multi-week in-school portion), the New Jersey Road Runners Youth Foundation (sponsoring the finishers medals), and the New Jersey Marathon and Half Marathon. We are all proud of this amazing event, and expect to offer it state-wide in future years. Registered Athletes: May bring one clear plastic bag, the one which was given to them by the race, with no other bag inside it. That Official Race Day Gear Bag must be dropped off at the Gear Drop Trucks inside Monmouth Park. Hydration belts and hydration bladders are allowed (as long as they do not contain pockets). Athletes wearing the hydration belts/packs may be asked to take a drink of the liquid. If you have questions over race weekend there will be Information available in many locations and ways. There will be an Info booth just inside the Main Expo Entrance (to the right), a tent as you enter Monmouth Park at the Start Area and a tent at the Finish Line Festival area on race day. In addition, there will be staff roaming around each of those venues wearing shirts which say: “Got A Question?” on the front and “Ask Me!” on the back. If the Ask Me folks can’t answer your question they will direct you to one of our Info booths/tents. We have a few volunteer positions still open for race weeks shifts (April 23-26). If you’d like to be part of the action and involved in some of the many activities required to put on this weekend event, we would be glad to find a spot for you. Send an email right away to: Volunteers@NJMarathon.org, as we’re almost full. Sign up for a VIP Experience. VIPs will receive: a special meeting with our Race Director and local dignitaries, special expo and race day parking areas, special start and finish line food and relaxation areas, special bibs and bib numbers, etc. Listen for your bib # to be announced as one of our many Finish Line Raffle winners. You’re automatically entered in the raffle as soon as you cross the finish line (they are chosen by finisher’s bib numbers). Among other items, we will be raffling off six pairs of Skechers Performance shoes. That’s the brand and line of shoes which America’s top marathoner, Meb Keflezighi, wears! When planning you visit to our Health & Fitness Expo and Race Packet Pick-up service please check out our free Presentation Series and Exercise classes listed in Race Director Update #8. Weather permitting, we will again have musical entertainment in the area in front of the Expo main entrance. We’re attempting to change the lives of families in African villages again by donating used athletic shoes to the MORE Foundation during the Expo. It takes the proceeds from 600 pairs of shoes to sustain a family for a year, and we’d like to adopt several families again this year! Together we have supported 8 families since 2012. That’s a lot of shoes! We thank you for giving us your old training and racing partners! We encourage you to continue the tradition this year. Move for Hunger will be conducting a food drive again this year during the Health & Fitness Expo. Please remember, it’s “cans in hands” when heading to the Expo. Please help us to end hunger here in New Jersey!! Together you have donated over 6,000 pounds of food. Thank you for your generosity! I hope that the information above will help you to understand what to expect during the many parts of race weekend and help you to better plan your time with us at the Shore. Thank you for registering for the 19th Annual Novo Nordisk New Jersey Marathon & Half Marathon weekend, which includes the 2015 RRCA New Jersey State Championship race in the marathon distance. In an effort to help make your participation more enjoyable throughout the entire race weekend, this is the eighth in a series of weekly messages containing important information. Copies of these messages will also be available on our Website and on our Blog. Links to them will be posted on both Facebook and Twitter. We have posted important Security Information on our website, under the “Event Info” menu item. Please read the appropriate information carefully in order to keep extra stress out of race day. Summary for Athletes: You will be allowed to carry one clear plastic “Race Day Gear Bag”, which we will issue you at race packet pick-up, in both the Start Area and Finish Area, AND only as long as you are wearing your bib and it is clearly visible (in order to identify you as a registered athlete). Summary for Your Supporters: NO BAGS OF ANY KIND are allowed in both the Start Area and the Finish Area. In order for your supporters to fully enjoy the race day experience with you, please communicate the NO BAG Policy to each of them. There will be NO EXCEPTIONS. If you forget the print out with your bib number, terminals will be available to look it up. It will slow down you process however, so we recommend you bring this printout with you. For your safety during your race, please take the time to fill out the medical and emergency contact information section on the back of your bib. While most of us feel that we’ll never need it, and we hope that you don’t, our medical staff has lost important time when treating athletes because they did not know about medical conditions and current medication(s). If that information is not needed it will never be seen by anyone, but that information could become very important should it be necessary. Please fill it out using an ink which will not run when wet. Our 2015 Presentation line-up is bigger and better than ever before! These free presentations and demonstrations from experts in many fields will help you to excel, remain injury free, make the most of race day, recover better afterward and inspire you. Be sure to check the presentation schedule below while planning your time at the Expo and Packet Pick-up so that you can take advantage of this wealth of information. They are free and open to the general public. 5:00 -5:30 Dr. Doug Mann Running Anxiety, etc. 5:30 – 6:00 Dr. Doug Mann Running Anxiety, etc. Move for Hunger will be conducting a food drive again this year during the Health & Fitness Expo. Please remember, it’s “cans in hands” when heading to the Expo. Please help us to end hunger here in New Jersey!! Together you have donated over 6,000 pounds of food since 2012. Thank you for your continued generosity! We’re attempting to change the lives of families in African villages again by donating used athletic shoes to the MORE Foundation during the Expo. It takes the proceeds from 600 pairs of shoes to sustain a family for a year, and we’d like to adopt several families again this year! ! Together we have supported 8 families since 2012. That’s a lot of shoes! We thank you for giving us your old training and racing partners each year! We encourage you to continue the tradition this year. I hope that the information above will help you to understand what to expect and help you to better plan your time with us at the Shore.